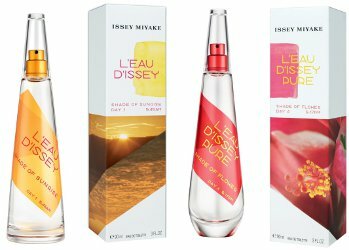 Issey Miyake has launched Shades of Paradise, a new collection of four limited edition flankers developed by perfumer Aurélien Guichard, with designs by colorist Mai Hua. The fragrances, two for women and two for men, were inspired by a trip to Japan and are intended to reflect four distinct moments in time. L'Eau d'Issey Shade of Sunrise (above left) ~ Day 1, 5:45 am. "...evokes a joyous, exciting and carefree holiday atmosphere and surrounds you with lightness and freshness." A floral with jasmine, ylang ylang, coconut milk and sandalwood. In 90 ml Eau de Toilette. L'Eau d'Issey Pure Shade of Flower (above right) ~ Day 4, 5:17 pm. "...a feminine fragrance that will make sure you are unforgettable wherever you go." A fruity floral with cassis, hibiscus and sandalwood. In 90 ml Eau de Toilette. 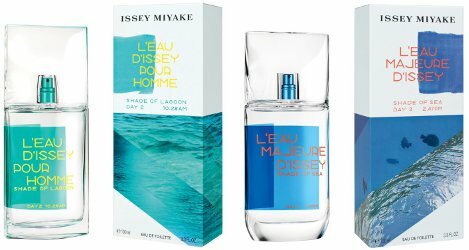 L'Eau d'Issey Pour Homme Shade of Lagoon (above left) ~ Day 2, 10:28 am. "...a very sensual and addictive scent which both you and those around you will fall in love with!" A woody fragrance with grapefruit, geranium, cedar and vetiver. In 100 ml Eau de Toilette. L’Eau Majeure d’Issey Shade of Sea (above right) ~ Day 3, 2:47 pm. "...an irresistible fragrance with a unique scent to accompany you all day long." A woody with bergamot, sea notes, cedar and sandalwood. In 100 ml Eau de Toilette. I got the regular Eau Majeure at the Duty Free Shop in early December… I am using it liberally and I’m almost at the half bottle mark. Loving it as an everyday scent for the office. Worth a shot! I would try Shade of Sunrise if I saw it, although not a huge fan of L’Eau d’Issey. Wish all fourbottles looked like the mens’. The lopsided label looks goofy to me. We are opposites! I like the design on the women’s but the colors on the men’s.